When EVERY moment matters ! Sudden cardiac arrest ( SCA ) is one of the leading causes of death in the United States, striking more than 340,000 victims each year. SCA can happen to anyone, anytime, anywhere and sometimes in extreme conditions. In the hands of those on the scene first, the Philips HeartStart FRx Defibrillator provides the power to safe a life. 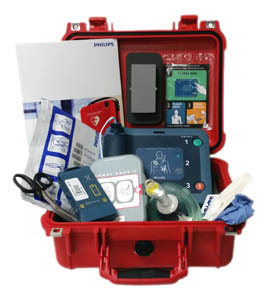 The Commercial Vessel Defibrillator Kit, configured by OceanMedix, is designed the for the rugged commercial marine environment, combining the industry-leading Philips HeartStart FRx Automated External Defibrillator ( AED /defibrillator ), essential supplies, along with spare pads and a spare battery, all in a compact waterproof hard-shell case. The Philips HeartStart FRx Defibrillator by Philips Medical Systems, a world leader in the development of medical devises and equipment, is a is a robust / "commercial grade" unit designed to withstand a compression test load of 500 pounds; a drop test onto concrete from 3 feet; and, meets the IP55 rating to withstand pressure sprayed water - not "waterproof"; yet, certainly much more substantial than the alternatives. 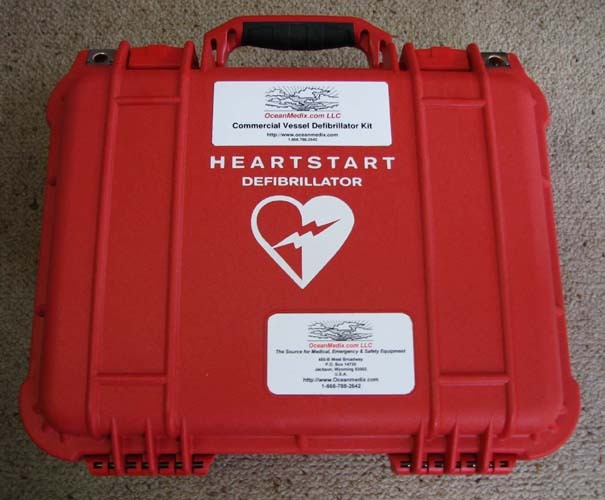 The Commercial Vessel Defibrillator Kit is a worthy consideration for the commercial fishing, work boat, commercial / industrial, law enforcement, search and rescue, and military communities. OceanMedix provides product notification and replacement services for date sensitive product components to include the Smart Pads and long-life lithium batteries. OceanMedix issues a Physician's Prescription for Automated External Defibrillator ( AED ) / Certificate of Authority with each Commercial Vessel Defibrillator Kit. OceanMedix can advise or make arrangements for AED Training and Certification in most locations within the USA. For more information, please contact us. HeartStart Defibrillators are intended to be used by responders trained in their use. Physician medical oversight (medical direction) is an important component of an effective early defibrillation program. 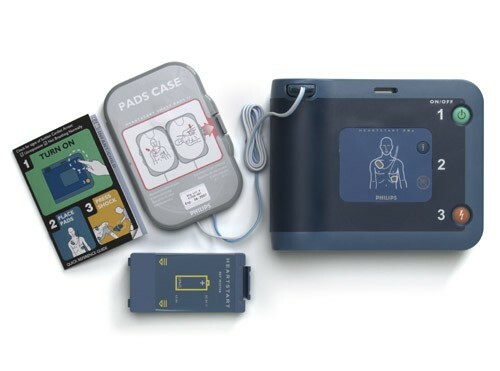 OceanMedix Defibrillator Kits and Accessories can only be shipped within the USA due to distribution agreements with Philips Medical Systems, a division of Royal Philips Electronics, a worldwide company. OceanMedix Defibrillator Kits, Defibrillators and Defibrillator batteries can only be shipped via HAZMAT Ground. OceanMedix Defibrillator Kits and Accessories are shipped directly ( "drop shipped" ) from our vendor to you. These items will arrive as separate shipments than those items shipped directly from OceanMedix. These items will be shipped within 2 - 3 business days of receipt of your order. Separate tracking numbers will be provided. Click the button below to add the Commercial Vessel Defibrillator Kit to your wish list.